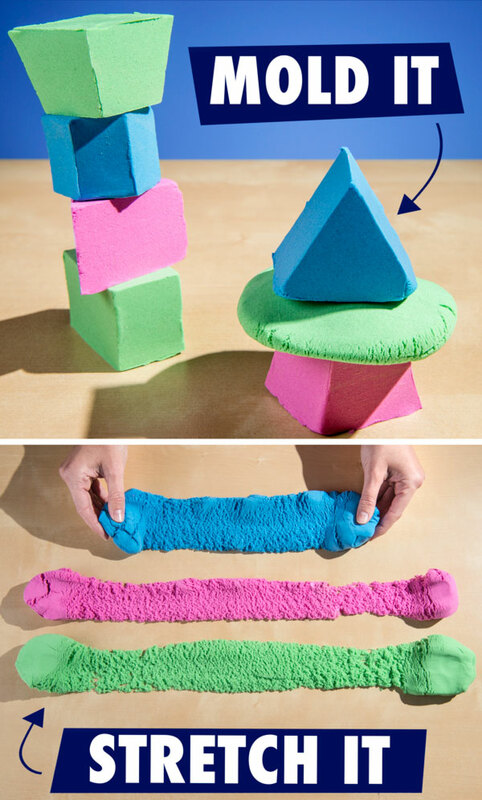 Mad Mattr: Super-soft stuff that’s fun to squeeze and stretch. What if a mad scientist Frankensteined together all the flowy fun of play sand and all the moldable malleability of Play-Doh? You’d get Mad Mattr, of course! The weird wonder-material is a sculptable blob that keeps your hands busy as you stretch it, pack it, knead it, and watch it flow. So why would you ever want to buy something that seems like it was cooked up by an evil genius? Because Mad Mattr is so fun! 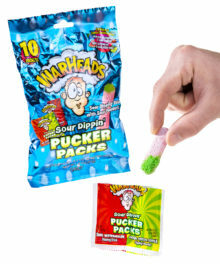 Please note: The Brick Maker Set includes the plastic mold pieces as well as 2 ounces of Blue Mad Mattr. 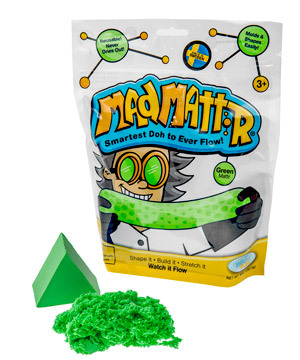 Like other dohs designed for play, Mad Mattr is a molding compound that easily packs to form almost any shape you can imagine. But stretch it out and you'll find out what makes this material different. The play clay transforms to a light, airy handful of fluff that's like massaging a cloud. Once you've stretched it to its breaking point, smush it back together and start all over again. Get your hands on this strange stretchy stuff. 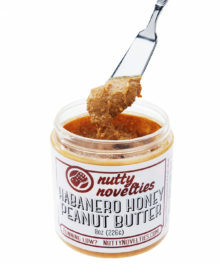 Mad Mattr is infinitely moldable. Compact and compress it, meld pieces together, and easily scrape bits away to make your imagination come to life in bright colors. The very same stuff also stretches in soft, air-filled ropes that feel like pillars of pillows. Mad Mattr is whatever you want it to be. Messing with Mad Mattr isn't messy at all. That's because the nature of the clay makes it stick to itself, so you can use a clump of the clay to pick up more of it. Think of it as a kind of a whack-a-mole fun game! Cutting through Mad Mattr is one of those oddly enjoyable experiences that satisfies all of your senses and gets your brain tingling. You'll have to pick up your own batch to try it yourself, but crank up the volume and watch this video while you wait for your order to arrive. 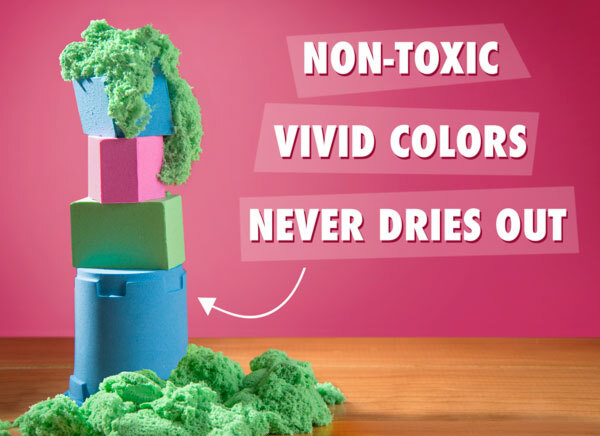 Parents can feel good about Mad Mattr because it never dries out and is non-toxic. Kids can feel good about Mad Mattr because it feels awesome to play with. 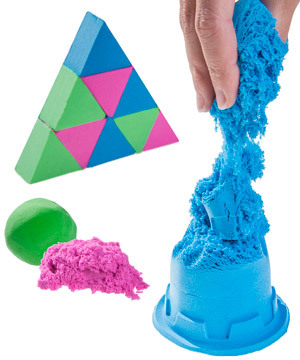 The super-powered modeling compound is currently available in blue, green, and pink. 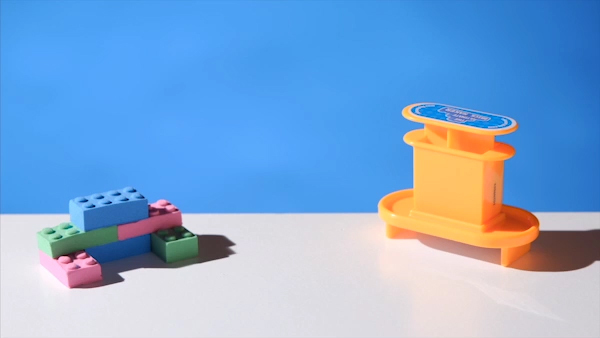 Take your Mad Mattr molding to the next level with Lego brick-inspired building blocks. The optional Ultimate Brick Maker Set enables you to make perfect-specification building blocks that actually lock together. Simply add a wad of Mattr, give the press a squeeze, and remove your newly formed brick complete with pips on top. Stack them together, and they're unlikely to topple. But since they're made of Mad Mattr, you can still enjoy smashing your structure before packing the bricks again. 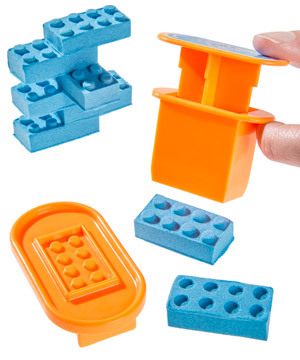 Please note: The Brick Maker Set includes the plastic pieces shown below as well as 2 ounces of Blue Mad Mattr. No matter how hard you huff and puff, these bricks aren't blowin' down. Jon and Joey, members of the Vat19 video team, take a first look at this amazing material. Jon and Joey take a first look at Mad Mattr. Question: What happens if I combine different colors? Answer: When you blend two different colors of Mad Mattr, the color will change to a grade between the two colors. For example, combining blue and green Mad Mattr creates teal Mad Mattr that works and feels just like its original parent colors. Once combined, Mad Mattr will not easily separate back to the original colors. Question: Can you light Mad Mattr on fire? Answer: That's somewhat of a dangerous question, but we certainly tackled it in our Burning Questions video below. 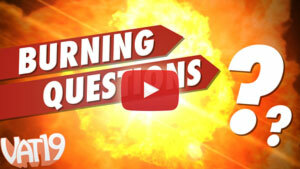 Check out our Burning Questions video for Mad Mattr. 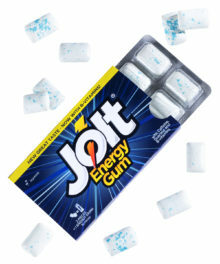 Question: What happens if I combine it with other modeling compounds or play sands? 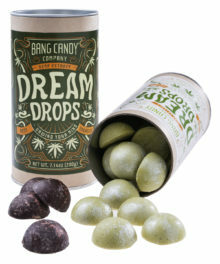 Answer: Mad Mattr will lose some of its special properties if you mix it with other stuff, so we don't recommend it.